Learning outdoors - what can be better? My name is teresa Monica Schnee. I have been teaching in River Edge for 10 years. I speak four languages and love to travel and learn about new places and cultures. My passion is language in all its forms and from every land. 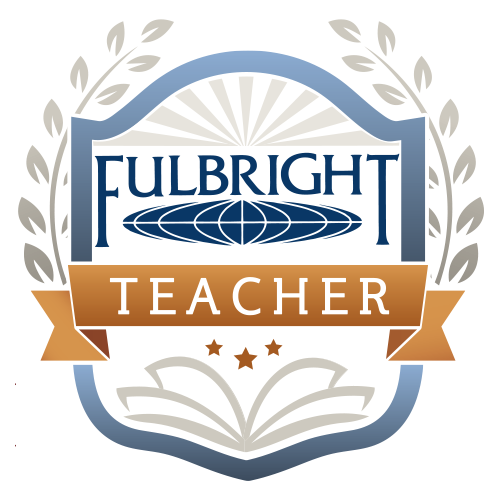 I am thrilled to pursue my passion as a Fulbright Distinguished Award Recipient. I will be learning about schools, culture and life in south Korea this fall. I specialize in working with learners who are acquiring literacy and English language in The primary grades. I also coach teachers on literacy, Second Language Acquisition and Best Practices and consult with school districts. I have written curriculum for the state of New Jersey, I am a WIDA CErtiified Trainer and I teach assessment For English learners at the graduate college level. Some of my favorite things are reading and writing and sharing the wonderful books we read with your child and you. Please join me in the amazing journey of discovery and learning that begins with you and your children at home and continues with their experience in school. ﻿The Child/Parent Blog﻿ is the place where you and your child can answer higher order thinking questions about the pictures I take. You can have meaningful conversations in your language and in English. Please use this blog as "the homework" page and as a place to reflect and to talk with your child about our world. You may write in English and our language. We want to read your comments so don't worry about making mistakes. Your thinking is what counts! It is the first tab. Just click on it and add your comments! My philosophy: Learning a language is learning about the world. Being bilingual is a gift that we work on and keep for life. I know how hard it is as a bilingual speaker and as a mother of bilingual children! We learn by listening, talking, reading, singing, writing, participating in experiences inside and outside the classroom. The most important part of our learning is "thinking". We write digital stories, record ourselves reading our poems, share what we know with our friends and the world. We use our languages to learn from each other. Parents, please continue to speak and to read to your child in your own language. They will always have English! I have taken all the photographs in this website and all the work is produced by your children. Use the website to support your child's learning. Here are sites you may use for translation. Please note that they may not be fully accurate! Below is a slide show. Click on the images to see them closely. Move the volume in the middle to the right to hear the music. Enjoy!